On Friday Sharon of Phoenix Daily Photo awarded me the BFF (blogging friends forever) award. Thank -you. I am grateful you felt my blog was worthy of an award. I am aware that some awards contain viruses (I am not saying this award does), however, I have decided not to put any blogger award links on my site just to err in the side of caution. It looks like the Fat Controller is looking for a new station to house Thomas the Tank Engine & his friends! 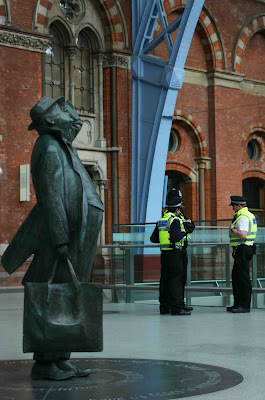 Unusual photo from St Pancras. He waiting for the recession to collapse on him. This is a splendid shot! Your yesterday's photo was superb, btw! Love it. Gail beat "Louis" to it! "Louis" thought the same thing!